One of the more common forms of coccidiosis in commercial broilers. Because of the area of intestine affected it tends to have a significant effect on productivity and susceptibility to necrotic enteritis. Caused by Eimeria maxima, of moderate to high pathogenicity it is seen worldwide. Morbidity and mortality are variable. Blood or pigment in the faeces. Depigmentation of skin and plasma is especially evident in this form of cocccidiosis and this is commercially important in some markets. Petechiae and thickening of middle third of intestine. Mild to severe enteritis, contents often orange in colour, mucosa tends to be pinker than normal. This infection is often associated with E. acervulina coccidiosis and there may be large numbers of characteristic oocysts in smears. Signs, lesions, microscopic examination of scrapings. Differentiate from necrotic enteritis, non-specific enteritis. Sulphonamides, Amprolium, Vitamins A and K in feed or water. Figure 13. 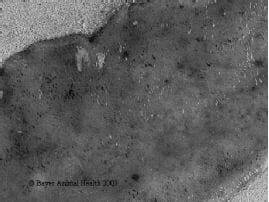 Moderate Eimeria maxima infection in the jejunum of a chicken (Score 2). The lesions are subtle compared to other forms of coccidiosis. The intestine is slightly thickened and there are scattered haemorrhages in the mucosa when seen from the inside.